Just a quick reminder that our July meeting will take place on Saturday, July 12 2014 from 10 am to 12 pm at the Stratham Public Library in Stratham, NH. Please note that this meeting will take place on the second Saturday of the month, rather than the first, to avoid the July 4 holiday. We will need one person to volunteer to bring an iron/ironing board. There is no need for rotary cutters/mats (I believe this means we get to try Amy's Sizzix cutter!). Please also remember that our Michael Miller fabric challenge projects are due. Bring your project and be ready to keep quiet about which one it is! A blind vote will replace show and tell for this meeting, and we will be giving a copy of Playful Little Paper Pieced Projects to our guild's winner. We'll also be collecting lottery blocks! Please bring $1 per block you make to buy an entry. We're making the same block all summer, Happy Quilting's Star Value Block (16'' size) so you may even have more than one chance to enter. This would be a great one to win! These blocks look fantastic and are very high-impact. Save all of your regular show and tell projects for August. Hope to see you all soon! We held our June meeting on June 7 at the Stratham Public Library in Stratham, NH. Our meeting opened with an informal discussion of our summer lottery block. We'll be drawing a winner at the September meeting, so there is still plenty of time to make one--or many--blocks and have a chance to win these beauties! Here is the link to the tutorial. Please make the 16'' block size (which is composed of 64 2.5'' squares OR HSTs squared to 2.5''). It's a good scrap buster! Our July meeting will be held on July 12 from 10 am to 12 pm at the Stratham Public Library (NOT the first Saturday, due to the Fourth of July Holiday). Mark your calendars! Our Michael Miller Challenge projects will be due at the July meeting. At our July meeting, voting for the Michael Miller Challenge projects will take the place of usual show and tell. Please save all your non-Challenge projects to show off in August. We'll be attempting a blind vote, and the winner will receive a copy of Playful Little Paper-Pieced Projects. 3) Click Login, and log in with the email address and password associated with your MQG account. You'll be taken to your profile page. 7) Click the "Quick Reply" button to create a new post. Click the little icon furthest to the right that means "media" and upload your photo. Add any text you want about your photo, and click Post. In other Modern Quilt Guild business, please remember that QuiltCon registration begins June 24. All of the information, including a schedule, registration details, and pricing can be found at http://www.quiltcon.com/ . If you would like to enter a quilt in the QuiltCon show, please find information here. Nancy showed off two rows of a quilt she is making for her bed to try to bust her scraps and stash. It is going to be huge, and colorful! Can't wait to see this finished. Barbara showed off some bunny wool felt applique pillows that she has been making while her students are taking tests this spring. She kept pulling them off her pile--Paula joked that they were multiplying like bunnies. I love how the slight variations in the colors she chose for the bunnies, flowers, and leaves change the whole look of the pillows. Sarah is the host for a Do Good Stitches circle, and this is a quilt top she just finished piecing. The vibrant citrusy colors are so "her"! Paula took some "made fabric" from last month's improv workshop and made a star tabletopper. The bright colors in her work have me itching to try some made fabric myself. and she finished quilting her Snake Trail quilt. It was a good meeting! 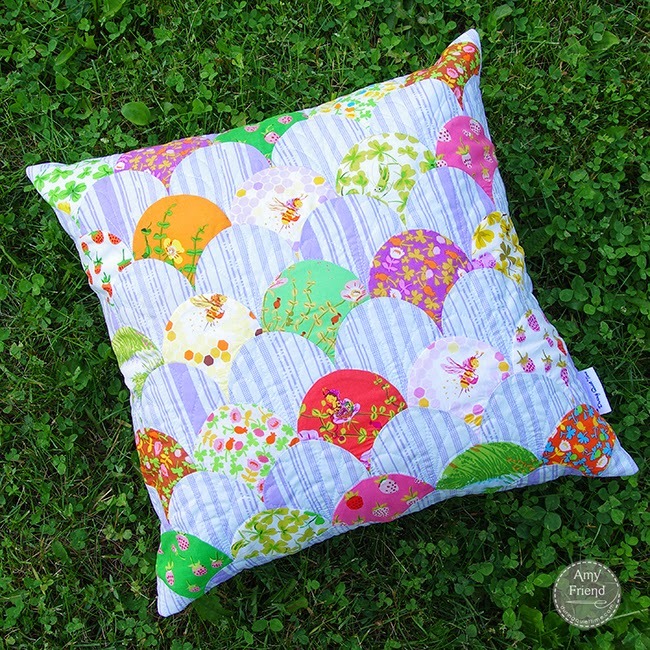 Hope to see as many people as possible in July for Amy's machine-pieced clamshell workshop. You can check the previous post for details about some supplies you will need, and I will post a reminder before the meeting. Happy summer stitching!